My Face on Kraft Peanut Butter! I don't know if I am the only one with one of these but isn't this cool? 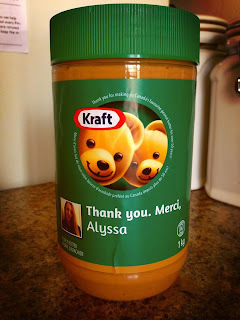 My picture is on a special "Thank You" Peanut Butter Jar! No, you won't be able to find this in store, it's a special gift. You're probably wondering how this happened, it's not that crazy a story I promise! If you have been reading this blog for some time now you may have noticed I have worked with Kraft Canada on several different product reviews and giveaways here on A Motherhood Experience. I also Tweet often, I'm very active in social media (when I can or have the urge to just tweet my heart out) and I guess Kraft has noticed over the years. I was sent an email a few weeks ago asking for my info, a picture and if I could be sent a peanut product from Kraft Peanut butter. Intrigued and honoured that they thought of me, I said yes and sent my Twitter link so they could use that image for whatever they had in mind! A couple of weeks later I get a package via courier which looked like it could be a container or jar of some kind. To my surprise it was a jar of Peanut Butter with my picture and a personalized "Thank You" from Kraft! That is one gift I never thought of. I knew it was going to be something personalized but not my very own Peanut Butter jar! The kids thought it was so neat and couldn't believe it "Mom? On a peanut butter jar?!" "Thank You" right back at Kraft Canada for taking the time and consideration to make a blogger and brand supporter feel appreciated. It's always a pleasure working with a brand who knows not only bloggers but knows people too. Disclosure: NOT a sponsored post. Mentioned product was sent as a surprise gift. All opinions and comments on this blog are those of the author. Image by AME. That is so cool so are you going to open it or save it just curious? G.I. Joe Retaliation Toys from Hasbro! Post-it Mobile - Organizing on the go! New Tide, Downy & Bounce for Sensitive Skin! Spend March Break with Hasbro! A brighter smile with Crest 3D White WhiteStrips!